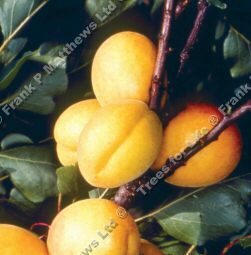 Emanating from Worcestershire and found on the side of the Malvern Hills, Golden Glow (Prunus armeniaca 'Golden Glow') is a very hardy apricot variety. It produces good crops of juicy apricots and may be either grown as a free-standing tree or trained along walls where spring frosts can be avoided. Fertility: This apricot is self-fertile, so no need for another apricot to act as a pollination partner for it to produce fruit although as with other self fertile trees, another Apricot tree within 50m may, should, might, could increase yield. We wanted to be clear that we were not going to commit 100% to the effectiveness of another Apricot tree nearby, did we achieve that? The smaller pot sizes e.g. 5-10 litres are generally around 1.2-1.80m tall. The larger pot sizes e.g. 10-15 litre are usually around 1.5-2.2 metres tall.